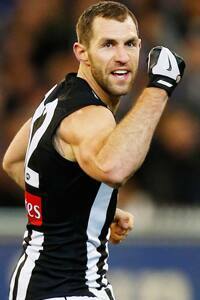 Travis Cloke has led Collingwood's goalkicking for the past three seasons. With two quarters of footy remaining in the home and away season, Travis Cloke was on the cusp of winning his first Coleman Medal. While he finished two goals short of overall winner Jarryd Roughead (Hawthorn), Cloke was a runaway winner of the Gordon Coventry Trophy as Collingwood’s leading goalkicker. The powerful big man bagged 68 goals for the season (66 in the home and away season) at a career-high average of 3.09 goals per game. He finished one goal short of equalling his career-high 69 goals in 2011, which were kicked across 25 games (Cloke played in only 22 this season). It was the third time in as many years that Cloke walked away from the Crown Palladium with this award tucked under his suit jacket. He also collected the J.F. McHale Trophy after finishing fourth in the best-and-fairest. It is the third time he has finished in the top four since 2007. It capped off a stellar season for the 26-year-old who was named at centre half forward in the All-Australian team for the second time in his career. He took 190 marks for the season (second only to St Kilda’s Nick Riewoldt) and held a league-high 58 marks. Cloke’s 68 goals saw him finish 38 goals ahead of the second placed Jamie Elliott (30).